It may not be the tallest, or the most famous, but one look at this striking waterfall is all you’ll need to persuade you to visit it. 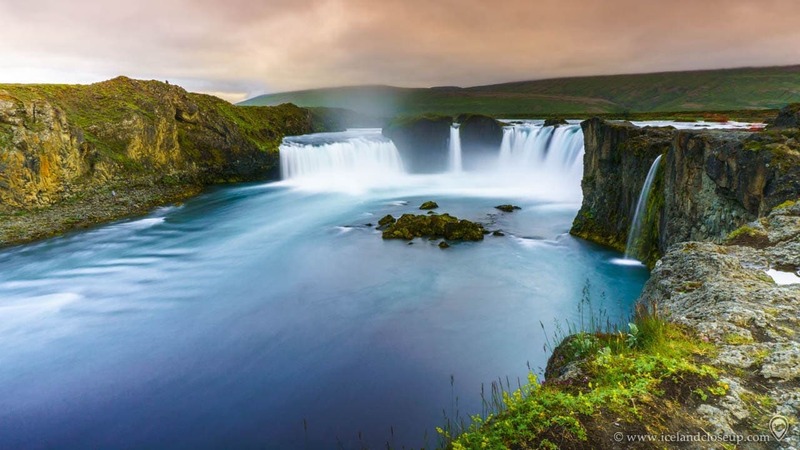 Goðafoss is widely held to be one of the most spectacular waterfalls in Iceland, and locals have nicknamed it “The Beauty”, in contrast to the neighboring Dettifoss, called “The Beast”. Goðafoss (sometimes written Godafoss in English), is pronounced GO-thuh-foss, and its name has an interesting history. Usually translated as “Waterfall of the Gods”, Goðafoss was named after a particular event in the country’s religious history. The folktale dates back over a thousand years, to the time when Christianity became the official religion of Iceland. 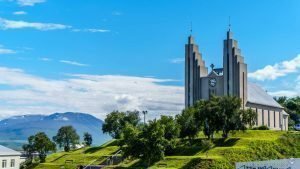 Þorgeir (or Thorgeir), a pagan priest (or political figure, depending on who you ask), was given the task of deciding whether the country would continue to worship their native gods, or to embrace Christianity—he chose the latter. To symbolize his decision, it’s said that he took his idols of the Norse gods and threw them into the waterfall, hence its name. Further historical connections can be found in another story, from an Icelandic saga set in a similar time period. It tells of the outlaw Grettir the Strong, who is said to have abseiled down into the caves behind Goðafoss, surviving the powerful torrents to do so. While there’s no evidence that any statues really did end up in the water, there’s certainly plenty for you to see. 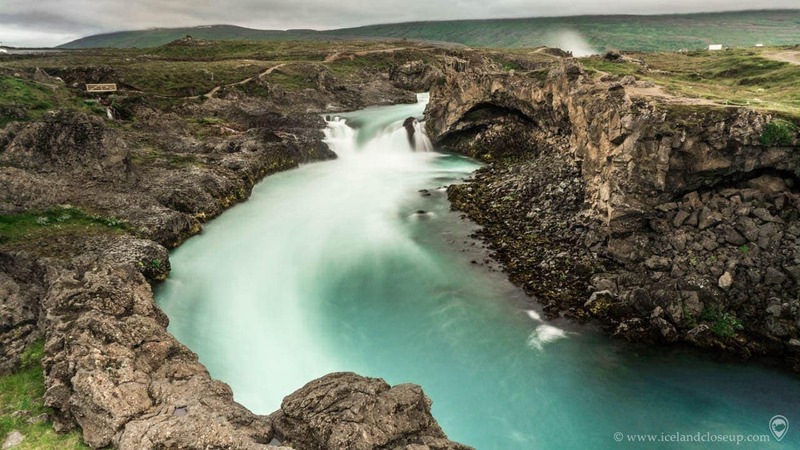 Goðafoss is 12 meters high and 30 meters wide, set in an astonishingly symmetrical, curved cliff. It’s fed by the river Skjálfandafljót, which begins in the Icelandic highlands and flows through Bárðardalur valley, an ancient lava field. This volcanic past is further seen in the unique rock formations in and around the waterfall, they are basaltic constructions in weird and wonderful shapes. Against the dramatic backdrop of the cloud-covered mountains, they create an elegant and majestic scene. 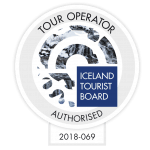 Whether you’re a holiday snapper or a serious photographer, you won’t want to miss out on a picture or three from Goðafoss’ three main viewing points. The west side is the most easily accessible, as it’s closest to one of two parking areas, but the east bank has an extra path down to the bottom of the basin, which gives you more perspectives to shoot from. Both sides are fully worth experimenting with, although you’ll need separate equipment to make the most of each. A wide-angle lens is highly recommended to get the best angles on the west side, while a 24-50mm gets the best results on the opposite bank. You should bear in mind that there can be more spray on the east side, and avoiding afternoon visits will help you to catch the best light there. In either location, slow shutter speeds can achieve some fantastic photos during the day, while longer exposures are the better option for bringing out colors at night and in the evening. During summer you don’t have to worry too much about dark nights, because there‘s almost 24 hours of daylight. Experienced photographers could easily be there for an hour or two, maybe even more, so you should set aside enough time for your desired shots. Goðafoss is located in northeast Iceland. 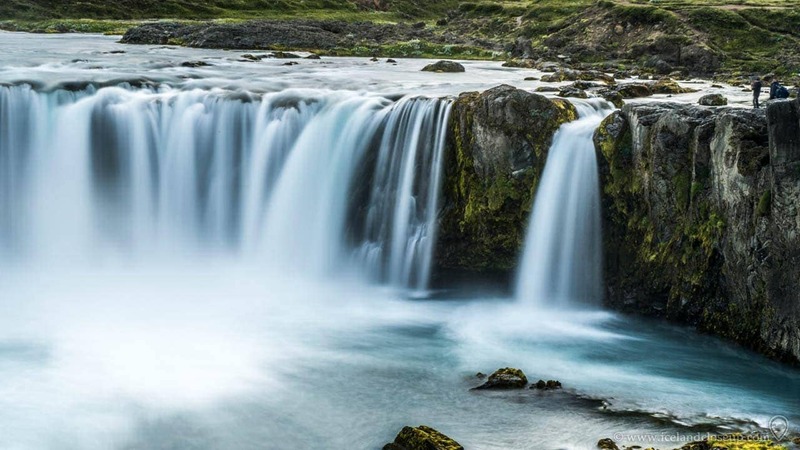 Guided by a map you can easily access the waterfall by car via Route 1, the Ring Road, roughly 50 kilometers east of Akureyri and 53 kilometers south of Húsavík. If you’re travelling by public transport, you can hop on bus 56 from Akureyri, Mývatn, and Egilsstaðir. Whatever your mode of transport, you don’t have to pay an entry fee to view the falls. Most tourists arrive in the parking area on the west side, and start their visit there. It provides a more frontal view of Goðafoss, and a glimpse of the smaller Geitafoss downstream. The scenery is beautiful and there are paths you can follow for shorter hikes, but you have to be careful. Visitors are advised to stay away from the edge, which now has no safety barriers in this area and can be slippery. Currently there is ongoing construction to make the area safer. Attempting to climb down is forbidden. The river is swift and powerful, making it dangerous if you fall in. You’re best off wearing shoes with a good grip, and a jacket or overcoat in case you’re caught by some spray from the waterfall. To reach the other bank of Goðafoss, you need to walk about a kilometer (which takes around 5-10 minutes) from the parking area, via a bridge. The steps down to the lower viewpoint are short, but take care, because they’re steep. From the eastern side, you can also reach a rest stop (more below). If you have your own car you can also drive to the other side, as there is a parking lot there as well. A few hundred meters from the waterfall there are places to rest your feet and grab a bite to eat. There’s a tourist information center, gas station, souvenir shop and café, guesthouse and restaurant, and restrooms. As with many restrooms in Iceland, the ones at Goðafoss require a small payment. If you don’t have any coins, you can exchange some in the souvenir shop or make a small purchase tax free. The guesthouse Fosshóll is open from May to September, you need to book in advance in order to stay there. In summer, there’s also the option to stay outdoors, on the campsite, but overnight camping at the parking lots is not allowed. 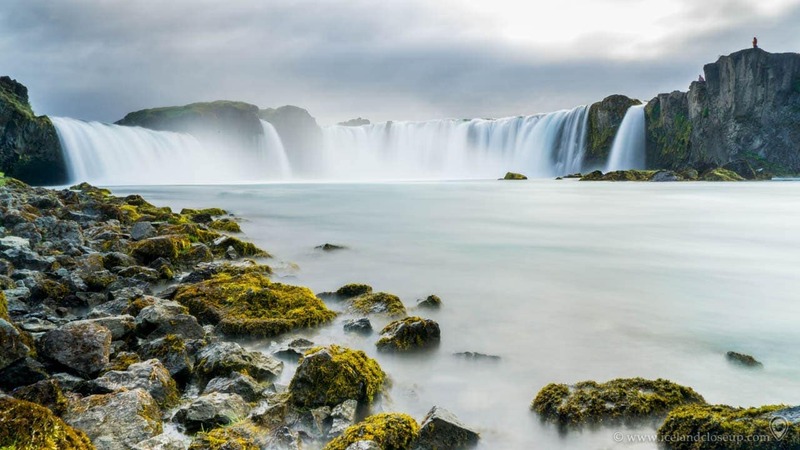 A 40 minute drive from Goðafoss is Iceland’s second-largest urban area. It boasts an outdoor botanical garden and many beautiful old houses. Highlights include summer festivals, whale spotting, and a church towering over the downtown area. 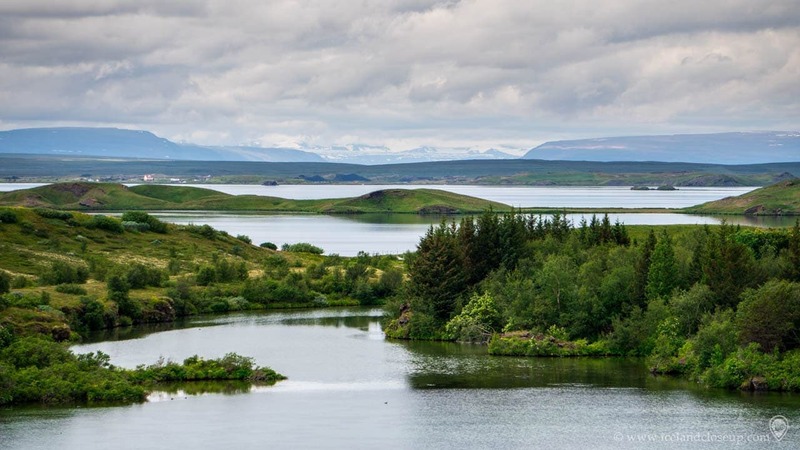 Also about a 40 minute drive away, Lake Mývatn is the fourth-largest in Iceland. 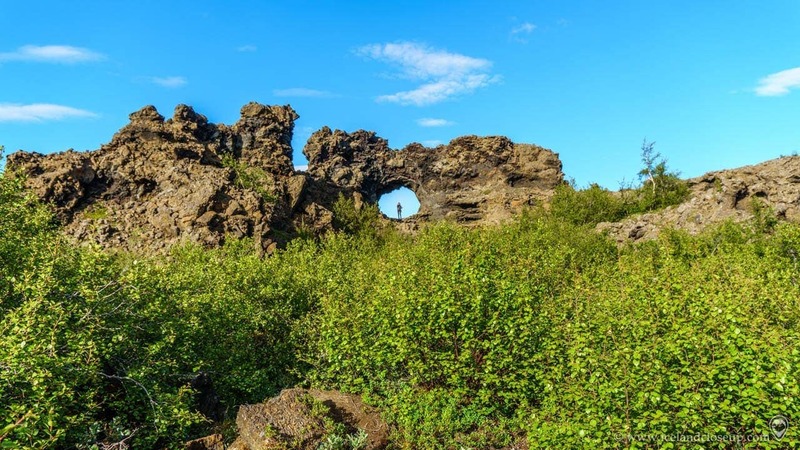 Here you can explore unique lava fields, sulfur springs, and geothermal pools and caves. In winter, there’s go-karting on the frozen surface, as well as snowmobile rides and dog sledding. Not far from the lake are some fascinating geological features; they‘re the only known examples of such lava formations on land. Translated as dark castles, or citadels, they form a giant, twisted playground of pillars and tubes that were part of a filming location for Game of Thrones. Some of the best views can be found at a viewing platform near Kaffi Borgir, a small restaurant, which uses local produce in its meals. Do you know anyone coming to Iceland? Share the article and let them know about this place. Once you’ve done that, you can subscribe to our newsletter below. You can find us on Facebook, Twitter and Instagram as well. We look forward to our trip in October! That’s great! I hope you will have a wonderful trip.